Crying is a fact of life when you have a new baby, but it can still be stressful for parents. Coping with the sound of an upset child is difficult, especially when you're woken up in the middle of the night and don't know what you can do to help. The first step is understanding the reasons why babies cry so you can take steps to soothe him or her. It's normal for newborns to cry for two or three hours a day, especially when they reach about six weeks of age. There are many different causes for these waterworks. The infant might be hungry, uncomfortable, bored, tired or sick. On the other hand, he or she might just want to be held for a while. In most cases, the tears slow down to about an hour a day by the time the child is 12 weeks old, but in the meantime, you have to find ways to return the child to the resting zone. Gradually, you'll get to know your baby's temperament, learning what's likely to bring on the tears and what can get him or her to stop. After checking for a dirty diaper and offering food, you can try a few different ways of calming down your baby. Holding him or her close and talking softly often works, as does swaddling or offering a pacifier. Be patient and keep trying until you find the best ways to help your newborn relax. 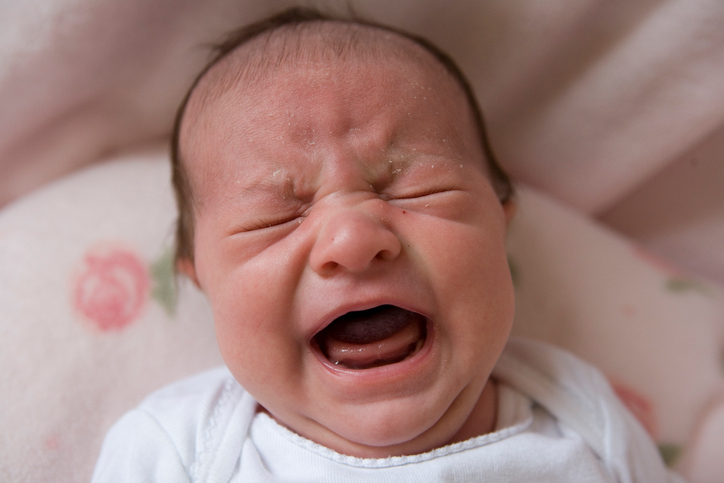 Find out more about what causes crying and what you can do to soothe your baby. 10 Ways to Survive Your Child's Witching Hour Why Do Babies Cry?